Wo es Computer gibt, scheint alles möglich. Fotos werden gescannt und verzerrt. Das reale Motive wirkt schließlich so unwirklich, dass einen nichts mehr erstaunt. 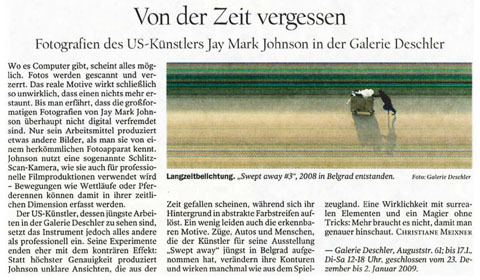 Bis man erfährt, dass die großformatigen Fotografien von Jay Mark Johnson überhaupt nicht digital verfremdet sind. When it comes to computers and images, everything seems possible. Photographs can be easily scanned and readily manipulated. Images become so distorted, so unreal, that reality itself loses its power to amaze. Such is the case across the spectrum of contemporary imagery until one comes upon the large-scale photographs by Jay Mark Johnson and learns that they are not digitally manipulated.